Now that the flames have been extinguished, now that the chaos has been calmed, residents of Napa, Sonoma, and Mendocino counties are starting to come to grips with the ramifications of the devastating wildfires that tore through parts of their counties. There’s no question the most immediate impact will be on housing—more than 8,000 homes and businesses across all three counties were destroyed and will need to be rebuilt. But wine experts say the wildfires may spark some big and lasting changes for the wine industry, too. Perhaps the most formidable of the potential problems is the possibility of a faint smoke flavor—also known as “smoke taint”—showing up in the next few vintages. Winemakers and viticulturists are split on the likelihood of this happening—because the majority of this year’s fruit across all three counties had been harvested and crushed before the fires started, many say the probability of smoke taint in the 2017 vintage is low. Early lab reports in Napa County appear to support this claim. Patsy McGaughy, communications director at the Napa Valley Vintners, said many of her organization’s member wineries have had samples evaluated at ETS Labs, a local testing facility, and numbers indicate little to no evidence of smoke taint at all with the wine already in tanks and barrels. Still, Bob Cabral, owner and winemaker at Bob Cabral Wines, notes that while the 2017 vintage might be safe, there’s no way to tell how the fires may affect the 2018 vintage until bud-break in the spring. 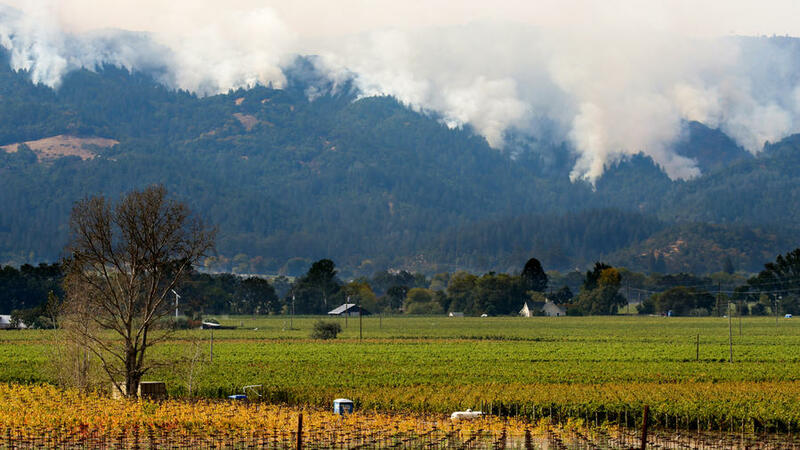 Many of the other potential impacts of the fires on the wine industry are more long-term. On one side of the business, grape-growers reportedly have contemplated beefing up crop insurance, adding emergency irrigation, and deploying teams of goats to consume undergrowth that could act as fuel for future fires. On the other side, winery owners have considered enveloping buildings in fire-resistant concrete, or in investing in cave wineries to bury equipment in the earth and keep it safer from the elements (though not, of course, from earthquakes). Jamie Kutch, owner and winemaker at Kutch Wines, said he has gone so far as to investigate the costs of purchasing large trucks and renting warehouse space in another location so he has the option of moving valuable inventory at a moment’s notice. At Lambert Bridge, a small family-owned winery in Healdsburg, the impact could be even subtler, in the form of an overhaul of the winery’s crisis communications plan. General Manager Bill Smart said that while he received a flurry of early morning text messages from colleagues after the fire began, he had a “very hard time” subsequently tracking down team members to make sure everyone was safe. However wineries decide to move on from these fires, one thing is certain: They’re adapting on the fly. The reality is that just about all wineries in Napa and Sonoma are open again, and many still have product to sell. Ultimately, these sales help the wineries stay afloat, and can help support future efforts to manage crisis. They also fund salaries for employees who lost everything. In short, wineries need your support now more than ever. Plan your next trip accordingly.